Well, it’s about time. I’ve had enough people ask me about when I’m going to start a blog, and frankly, written enough in my head over the years that it finally became time to do something about it. Kudos to Hugh Culver, an expert on helping people work more effectively, for the moral support (nagging?) to get me started, and to the good folks at Fusion Studios Inc. (they also designed and maintain my website) for the technical know-how to make this happen. Those of you who know me well but be aware that I’ve been writing for the National Post for a number of years (eight! 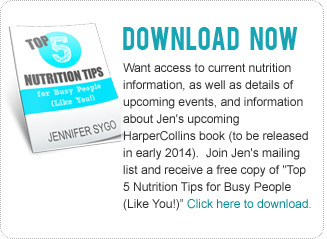 ), and had my first book, Unmasking Superfoods, come out last year. And while I often hear people say that they can “hear” my voice in my writing, I’ve never had an informal place (unless you count Twitter?) to share information. I think that’s what I’ll be looking forward to most with blogging: a chance to let my hair down, so to speak, and share what’s on my mind, without (gasp!) an editor. Nutrition for prevention and every day performance. In a nutshell, that means eating well to be well at any stage of your life, and to perform at your best at work or at play. I’m a firm believer in the nudge theory of behaviour change, meaning that small changes can go a long way to improving life-long health, but I also know that some people can have major wake-up calls that cause them to drastically change their life. Either way can work. The key is to find what works for you. Nutrition for sport performance. Sport nutrition has always been a passion of mine. For better or for worse, however, it’s a topic that is often mired in controversies and conflicting information. Should I eat carbs? (That depends. Do you want to go fast?). Is salt good or bad for me? (It might not be as bad as you think). Are sports drinks just sugary junk food? (Yes. But that doesn’t mean they don’t work). Do I need to take protein powder? (No. But it might help.). See? Clear as mud. I look forward to spending more time in the sport nutrition grey zone with you in the coming months. Nutrition trends and controversies. The sport nutrition world is just one area of nutrition that is stuck in debate these days. Are saturated fats good or bad? Is the Paleo diet just a fad? Should I go low-carb, gluten-free, or vegan? The answers to these questions aren’t always simple, but that doesn’t mean we can’t have fun debating them. And I’ll probably spend quite a bit of time talking about the way these controversies – and the people who feed them – drive me crazy, and even push the boundaries of ethics (no, you shouldn’t tell a 14 year-old female gymnast to “go Paleo”, unless you’re really into triggering eating disorders). In the meantime, I’m looking forward to talking about putting sport science into practice at the PANEX Conference in Toronto this Friday. I’ll be on a panel with Dr. Trent Stellingwerff and Dr. Stuart Phillips, two researchers whom I admire greatly, and whose work has changed the way we look at nutrition for performance. If any of you are in Toronto and attending, by all means, come and say hello.